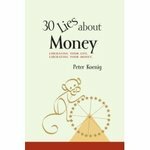 Comment on Amazon on "30 Lies about Money"
Peter Koenigs book "30 lies about money" is a happenstance. In helpful shortness we find all central critique and misunderstanding of our monetary system. For anyone who wants to learn in one evening what is doubtful when it comes to money, this is the start. that not everyone can make profit simultaneously, that the quality of an economy is not measured by GNP and that money is not issued by governments. 31. Men handle money better than women. This is a thought-provoking foray into what money means, how it works, and more interestingly how it does not work. This is not a "how-to" or self-help or standard text that any student-of-life, or finance, or economics might expect. Nor is it a "sit-back" and take it all in styled reader. Instead, it is a highly reader-participative text that contains a series of 30 simply expressed misconceptions the author calls "lies". The opening introductory chapter is the most reader-participative of all. It comprises a blank page where readers are invited to jot down what money means for them. The way the lies are visually presented also encourages readers to reflect, by leaving a blank page between each lie thus creating an occasion to pause for thought. The author is at his best when he brings philosophy and psychology to inform us about the foundations of money, its capabilities, its incapabilities, our attitudes towards it, and our management of it. Amongst some of the best substantiated "lies" are "You need a certain amount of money to be happy", or "Money is security". The author is rather less successful when he employs the disciplines of economics and finance. As a result, unfortunately, the 30 simply expressed misconceptions themselves contain more than the occasional misconception. For example, the role of money as a means of exchange in a trade transaction is sometimes confused with money having the ability to be easily transferred, but where no trade or exchange has taken place. At best, these misconceptions keep the reader alert by creating the healthy need to question everything. At worst, certain financial institutions and certain financial instruments are unfairly portrayed, sometimes in a malign way. For example, banks appear to be magicians creating money out of nothing, and siphoning the rewards of their sleight of hand into their own coffers. Financial derivatives are explained as "unreal trades", whereas they perform an essentially efficient economic role in the allocation of resources by finely differentiating risk, "stripping" the different risks out, and finding a buyer [or holder] of that instrument who is prepared to accept that particular risk. Whatever your preconceptions about money, money spent buying this book is well spent because many of the misconceptions outlined by the author are cogently argued and thought-provoking. Much has been written about money—how to invest, save, become a millionaire, get out of debt, find financial freedom, change the monetary system, manage a business, hedge or save taxes. So what makes this book stand out from those already in the bookshops? Written for lay reader and expert alike, 30 Lies is a response to a newly emerging trend, where peoples' interest in money is not just to try and make more of it. But to understand better the causes of the increasingly contradictory money world they find themselves in. Some of the issues: income inequity, increasing stress in making ends meet, decay of social systems, evaporation of pensions, polarisation of wealth, third-world indebtedness, Enrons and more. This book promises a simple understanding of these issues. But it goes further. This book not only exposes misleading flaws and "lies" in many universally accepted and unquestioned assumptions about money—it dissolves them!